Reading Rich Westwood‘s recent Euro Crime review of Shadow Sister reminded me of the Dutch author Simone van der Vlugt, whose two novels that have been translated into English are both very enjoyable, in a dark, suspenseful way. Shadow Sister (translated by Michele Hutchinson, my review at link) is about twins, one a schoolteacher and the other a photographer. Their different attitudes to materialism, men and the job market first strike one about these young women, but gradually we come to see how their past life when children has affected them. One of the nice things about this book is the unreliable perception of reality, depending on which twin is narrating the story. The Reunion is the other book by this author that has been translated (again by Michele Hutchinson) and published in English. Again, there is an unreliable, possibly unstable, narrator, Sabine, recently returned to work after a bout of depression. Gradually, we come to learn more about Sabine’s life and past, and it is not pleasant. Rich’s Euro Crime review of Shadow Sister touched upon the ordinary lives of the characters. He writes: “Its setting in suburban Rotterdam may as well be suburban Slough, and its Further Education college, shopping mall, and nightclubs could be situated in Leicester, Hull or Stoke. The characters are teachers, photographers, software engineers and teenagers, all people that you might find in your local town centre next Saturday lunchtime.” This made me wonder, in the context of this challenge, what other books by women authors use the ordinariness of setting to cover up distinctly non-ordinary secrets, secrets that gradually are revealed? I have to think of three such authors…. Jessica Mann‘s The Mystery Writer is in one respect about an ordinary character (“Jessica Mann”) who is in Cornwall researching a book about a (true-life) disaster of World War 2 – the sinking of the ship City of Bernares as it was carrying evacuees from the UK to Canada. She witnesses the attempted suicide of a woman, which is the start of the gradual revealing of many family secrets and previously hidden crimes, in a very clever set of plots. Esther Verhoef, another Dutch author, tells the story of Margot Laine in her novel Close-Up. Margot is an ordinary salesperson who has to cope with being dumped by her husband after seven years of marriage, including being looked down on by her own parents and being stood up by a girlfriend when she attempts to take a holiday to cheer herself up. Soon, the insecure Margot is being wooed by a very handsome man, a celebrity artist — but what does he see in her, and what happened to his first wife? Margot is increasingly sucked into a maelstrom that is very far from ordinary. School is a place that is much the same the world over, one might think. In Yaba Badoe‘s debut novel True Murder, young Ajuba is trying to get over her mother’s death. She lived in Ghana but has been placed by her father in an English school in an attempt to provide her with a “normal” life. There, Ajuba is befriended by Polly Venus and hence gets to meet the Venus family in the school holidays. Another situation that becomes distinctly abnormal as the pages turn! Claudia Piñeiro achieves that very difficult balance between writing an involving novel and making you laugh. Her books are not overtly funny in terms of set-pieces, slapstick and so on, as is the case in much “comic” crime. Nor are they conventional crime novels as such, in that they don’t feature detectives or very linear narratives – though murders do happen! For me, these books work because they are satires on human nature as the protagonists desperately strive to maintain their fragile images of themselves in an excessively consumerist social context. The humour works at the level of a light-hearted treatment of serious, warped issues – most particularly about how our materialism forces us into situations that get ever more extreme. All Yours, a “perfectly pitched black comedy” about a woman desperate to maintain her view of her marriage as perfect, whatever the evidence to the contrary. Three other authors who write similar books and whom I’d recommend? Teresa Solana‘s two Barcelona-based novels, A Not so Perfect Crime and A Short Cut To Paradise, skewer the social, artistic and literary pretensions of the Catalonian scene, while introducing the oddest pair of brother-detectives in crime fiction. Donna Moore, in Go to Helena Handbasket, whisks hilariously through every cliché in the many crime-fiction genres. This book does not so much focus on the social or political comment aspects, but there are plenty of gems to pick up if can manage to look while you are laughing yourself silly. Leigh Redhead‘s Peepshow is about women trapped in the “hostess” industry in Australia – yet ‘trapped’ is the last thing they feel they are. One of them, Simone, has a PI license, and when a body is found in the sea, she decides to use this to investigate the crime and escape into a more appealing work life. More about the author and her excellent books can be found at her website. Unfortunately this site is not very up-to-date, but I hope we will be able to read more of her work soon. Karin Alvtegen, a wonderful author of psychological thrillers. My reviews of three of these, Missing, Betrayal and Shadow, are at Euro Crime. 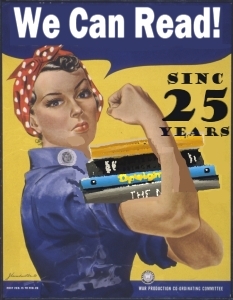 If you haven’t read her, all I can do is to urge you to do so! (But be warned, her books are very bleak.) About her latest book, A Probable Story (not yet translated): “Once again, Karin Alvtegen has proven her skills in telling a story with many depths. It is in many ways a display of human behavior, her characters struggling with their personal demons. It becomes obvious that the behavior we try to hide inside of us becomes instead the inner driving force of our lives. The compelling psychological drama keeps the reader captured to the end.” This passage summarises rather well the genre of “psychological suspense” which, when done well, I enjoy very much. Diane Janes is another author I’ve mentioned in this series. Her second novel, Why Don’t You Come For Me?, is a great little example of a psychological suspense novel in which the author, like Frimansson and Alvtegen, is not afraid to follow her premise to its logical conclusion, however bleak. Karen Campbell is my fifth choice in the expert challenge. 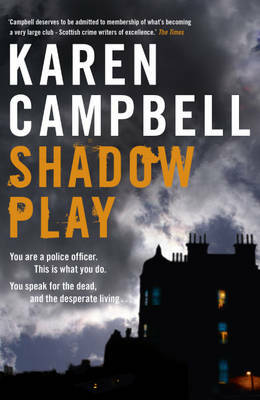 She’s written four novels set in Scotland, all featuring to a greater or lesser degree Anna Cameron, who progresses from a Glasgow lower-ranking detective in the first novel to a more senior role in the fourth. None of these books obeys a formula: the first highlights the general ghastliness of inner-city policing in a crime-ridden, poverty-stricken area; the second is a detailed account of the failings of the Scottish criminal justice system, in particular the failure of prison to act as a reforming influence; the third tackles police politics and various issues concerning care homes for the elderly; and the last is about policing big events and the influence of technology on privacy, against a background of a crime from the first novel that comes back to haunt Anna, who has been on a long journey to arrive at a very different place from where she was in that first book. Three authors who write in a similar vein? Well, I’ve read books by quite a few male authors writing about senior female police detectives, for example Martin Edwards, Mons Kallentoft and Kjell Eriksson, but I have read fewer women authors who choose to focus on the female DI (or thereabouts in rank). Denise Mina is another Scottish author who writes big, muscular books. Until recently she had not focused on the police force, but in her two last novels (Still Midnight and The End of the Wasp Season) she has introduced Glasgow DS Alex Morrow, who has to act tough in a man’s world in order to progress. Alex, like Anna, has personal dilemmas to deal with as well as professional ones. And like Karen Campbell, Denise Mina attacks many issues of social and political injustice, but from a perspective that makes it more obvious what she, the author, wants the reader to think. Karen Campbell writes with more shades of grey, perhaps presenting a more rounded look at some of these issues. I hope you’ll like it. That you’ll like the biting cold of midwinter, the austerity of the people, the dogs that are so important in all my books. I hope you’ll like my police officers: pregnant Anna-Maria with her horse-face, her idle husband whom she loves in spite of everything, and all her children; her colleague Sven-Erik Stålnacke, a man of few words, with his moustache which resembles a squirrel that’s been run over. And I really hope you’ll like my main character, Rebecka Martinsson. I know she’s a little bit isolated from other people and a little bit difficult. The kind of person who works herself to death instead of asking herself how she’s feeling. But she does have her own story, a story she’s running away from. Asa Larsson’s next two novels, The Blood Spilt and The Black Path, were translated into English, and continued the story of Rebecka’s conflicts between old and new, city and country life, the real world and the “spirit” world. These stories were wonderful, but sadly the rest of the series was not translated and some time elapsed before a new publisher took on the books. The fourth, Until Thy Wrath Be Past, was published in the UK this year in a translation by Laurie Thompson, and continues the themes of the earlier novels. There is one more novel in the series so far written but not translated; according to Larsson’s prologue to The Black Path, her intention is for the series to consist of seven novels. I hope that anyone who has not yet read this author will try her books: they are listed below, with links to my reviews. Stef Penney, whose novels The Tenderness of Wolves and The Invisible Ones share themes of old mysteries, and of protagonists who are outside the society in which they live, and are conflicted about this. The two authors have a rather similar approach to wolves, in Penny’s first novel and in Larsson’s The Savage Altar, in which the life of a wild wolf is entangled with Rebecka’s fate. But the lupine aspect is not the only similarity that these authors share! Camilla Ceder is another Swedish author who so far has had one novel, Frozen Moment, translated into English. It shares with Asa Larsson a sense of people struggling in a remote community while the rest of the world is fixated on city dwelling and its associated “benefits”. There’s a police procedural element, in common with Larsson, and a tragic past back-story involving some of the themes addressed in Sun Storm. There isn’t an explicit religious or mystical aspect to the plot, however, although there is a great sense of location. Kersten Ekman is more of a literary than a crime writer, and I’ve only read one of her books, Blackwater. This novel is longer and more convoluted than Asa Larsson’s books, but shares many of the same elements: remote communtity; tensions between rural and city life; value-systems of the old and the young; superstitions; and a sense of threat if any old secrets should be in danger of being revealed. Margot Kinberg has written two delightful books in that enticing subgenre, “academic crime”. Her detective, Joel Williams, is both an ex-cop and a professor, bringing a calm sense of wisdom to the disturbing events that have happened previously. Margot herself is a professor, so she depicts university life with authenticity and insight, but never with a heavy hand. Now I have to recommend three authors who write in a similar vein. Carole Schmurak‘s Deadmistress is not set in a university but in a “posh private school”. The headmistress is killed and Susan Lombardi, a professor and educational consultant, sets out to solve the crime because a friend of hers has been accused of it. I enjoyed this novel, but have not yet read its two sequels, Death by Committee and Death at Hilliard High (all are available for a very reasonable price in Kindle format, I note!). Elly Griffiths has written three very enjoyable novels about an academic, Ruth Galloway, who as a forensic archaeologist is a consultant to the local (Norfolk) police. In The Crossing Places, The Janus Stone and The House at Sea’s End, we follow not only Ruth’s detective skills but her somewhat chaotic private life. Sisal-Jo Gazan‘s first novel, The Dinosaur Feather, is apparently based in part on her PhD thesis on the evolutionary relationship between dinosaurs and birds. This question is at the root of the crime in which PhD student and single parent Anna Bella Nor becomes tangled up. Although not as light in touch or as smooth to read as Margot’s novels, The Dinosaur Feather features a similarly authentic view of academic life, this time in a university in Denmark, and the tensions of academic success or failure. My reviews of Publish or Perish and B-Very Flat, by Margot Kinberg. 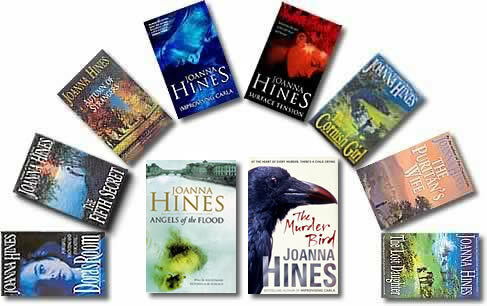 Joanna Hines is known to me as the author of The Murder Bird, a book I reviewed for Euro Crime, having first heard of it via a review at It’s a Crime! blog. I summed up the book as “a compelling little psychological thriller of dark family secrets” – it’s a story of the apparent suicide of a poet, and the efforts of her daughter to find out how she really died. The post at It’s A Crime provides the opening paragraph of the book, which is extremely “must-read-on-ish”, as well as some background information about the author. I am not sure why I haven’t read any more novels by Joanna Hines since I read The Murder Bird, but I have decided to rectify this omission as soon as I have reduced my stack of recently acquired books to manageable proportions. I enjoy reading suspenseful novels, and this author seems to specialise in the genre, with Improvising Carla, about a death on a Greek island; Surface Tension, another novel about family secrets concerning a 20-year-old murder; and Angels of the Flood, set in Florence and again about an old mystery. The author has also written historical novels set in Cornwall, in the south-west of England, and some earlier books “about secrets” which are categorised separately from the titles mentioned above. More about the books and the author can be found at Joanna Hines’s website. Barbara Vine (a.k.a. Ruth Rendell), whose books are on “themes of human misunderstandings and the unintended consequences of family secrets and hidden crimes.” A listing of Barbara Vine’s books, with a synopsis of each, is available at Wikipedia. I’ve read seven of the thirteen listed. Diane Janes has written two suspenseful novels of family secrets: The Pull of the Moon and the superior Why Don’t You Come For Me? Both these novels are in the same vein as Hines and Vine in tapping into the tensions bubbling below the surface of apparently normal domestic life. Morag Joss has written a book called Half-Broken Things which is about an odd collection of people living in a country house – how they got there and the consequences of the secrets that they all keep. Joss has written several other standalone books and a series about a musician in Bath (England), none of which I’ve (yet?) read. But on the evidence of Half-Broken Things, Joss’s books can be said to fall into this suspenseful “domestic secrets” genre, where the tensions between a small cast of characters are the focus of the book as opposed to police-procedural investigations, private detectives, or “thrills and spills”. I don’t think I am familiar with books from the USA in this subgenre, so any recommendations would be gratefully received. My Euro Crime review of The Murder Bird. Crime fiction reader’s review of The Murder Bird (at It’s a Crime!). Denise Hamilton is the female author who most nearly made it onto David Montgomery’s “top ten” detective novels list. I enjoyed her first novel, The Jasmine Trade, upon its initial UK publication as part of an Orion “new authors” promotion. Eve Diamond, an investigative journalist with the LA Times, struggles to make and keep a career in a city hypersensitive to ethnic and ethical tensions, and is as determined as hell to get to the bottom of things. The plot and outcome of The Jasmine Trade was original and moving– all in all a great debut. Although I enjoyed subsequent Eva Diamond novels (Sugar Skull and Last Lullaby), by the fourth, Savage Garden, I felt the series was becoming a bit formulaic and have not read any more of the author’s books since then (2006). Checking out the author’s website to see what she’s published since Savage Garden, she has written another Eve Diamond novel, Prisoner of Memory; edited two short-story collections (LA Noir and LA Noir 2); written another standalone novel, The Last Embrace, set in Los Angeles again but in 1949; and, most recently, written a novel called Damage Control, “murder and scandal in a wealthy political family” in southern California. I’m quite keen to try Damage Control, but in nominating the required three other authors writing similar novels, I’m going to stick to the journalism theme because I’ve only read the Eve Diamond (journalism) novels by Denise Hamilton so can’t compare any of the others to anyone. Mari Jungstedt: Swedish novels set on the island of Gotland, TV journalist Johan Berg investigates crimes in parallel to the police and usually collaborates with them to share knowledge and hence find the solution. He has an on-off-on relationship with Emma, a local schoolteacher. Liza Marklund is author of one of my top favourite series, about Swedish newspaper journalist Annika Bengztrom. Annika exposes a range of crimes including conspiracies among the political elite and the trafficking of young women, as well as dealing with a complicated personal life.